Hypothyroidism now appears to be one of the most common complications of diabetes. Fortunately, it is one of easiest conditions to manage. All it requires is taking one little pill the first thing every morning to make up for the thyroid hormone that we lack. Checking our TSH level is the usual way our doctors have to find out if we have hypothyroidism. Our pituitary glands make TSH, short for thyroid stimulating hormone. How common hypothyroidism is depends on how we define a normal TSH level. Currently, most countries set the reference range at 0.40 to 4.5 mIU/l. But some organizations and many new studies suggest that a level of 4.5 is far too high to be considered normal. The American Association of Clinical Endocrinologists considers 0.3-3.0 to be the normal range. But the National Academy of Clinical Biochemistry guidelines indicate that more than 95 percent of normal people have TSH levels below 2.5. The HUNT study from Norway reported in a 2008 issue of The Archives of Internal Medicine that they used the TSH test to measure the thyroid function of 17,000 women and 8,000 men with no known thyroid or heart disease. All the people in the study had a "normal" TSH level of 0.5 to 3.5. The people in the lowest TSH group, those with a level of 0.5 to 1.4, had 70 percent less heart disease than those in the highest TSH group, who had a level of 2.5 to 3.5. A few months ago a TSH test showed that my level was 4.17. My doctor and I agreed that I needed to slowly reduce it to 2.5 or below, and I am on the way there. Now, a study reported at the Scientific Sessions of the American Diabetes Association in San Diego on June 26 shows that people with diabetes have more hypothyroidism than we previously thought. The study, reported as preliminary research in a poster presentation at the ADA meeting, found that 3.4 percent of the 1,000 people with diabetes tested had TSH levels above 10.0, and another 11 percent had levels between 5.0 and 10.0. The study by Jothydev Kesavadev, M.D., and his associates at Jothydev's Diabetes and Research Centre in Kerala, India, also found that 3 percent of the people with diabetes that they screened had hyperthyroidism. Yet only 1.8 percent of them knew ahead of time that they had either too high or two low a thyroid level. 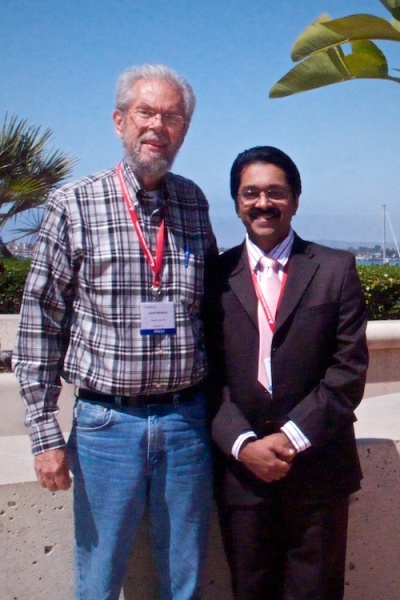 Since I was in San Diego to cover the ADA meeting for HealthCentral, I contacted Dr. Kesavadev. On June 27 I met with him and with Gopika Krishnan, one of the study's co-authors and a clinical research coordinator (pharmacist) in Dr. Kesavadev's clinic. Dr. Kesavadev told me that what is unique to people with diabetes is our doctors generally miss testing us for hypothyroidism "in 99.99 percent of the cases." Weight gain, tiredness, loss of memory, and lethargy are common to both diabetes and hypothyroidism, and clinicians never think of checking it, he says. We should have a TSH level between 2.0 and 2.5, Dr. Kesavadev says. "My target is around 2.0 -- never above 2.5. That is the comfort level for the patient. Below 2.0 again is an issue. If it is below 2.0, there is a chance that blood glucose and osteoporosis will go up." The study that Dr. Kesavadev and his associates presented at the ADA meeting focused on those patients with a TSH level above 5. That's because they prescribe medicine only to people whose TSH levels are so severe. But Dr. Kesavadev and Ms. Krishnan recorded what percentage of the 1,000 people in their study had TSH levels above 2.5. After they returned home, they sent me their data. Those percentages stunned me. Fully 48 percent of the women in the study who were 60 years of age or younger had levels above 2.5. Half of the women more than 60 were above that cut-off. Their study showed that men are not quite as much at risk for hypothyroidism as women. Yet 40 percent of the men who were 60 or younger had levels above 2.5. And 41 percent of the men more than 60 were above that cut-off. The conclusions are inescapable. All of us who have diabetes needs to be tested for our TSH levels. And we can't simply accept that they tell us that our level is normal. We need to bring our TSH levels down below 2.5.